Abu Dhabi Ports Company’s (ADPC) flagship Khalifa Port has set a new record handling more than 81,000 TEU containers in July 2013 alone. According to Abu Dhabi TV business bulletin, the monthly figure is the highest in the history of container handling in the UAE capital. ADCP says the transition of its container operations from Abu Dhabi’s Zayed Port (Mina Zayed) to Khalifa Port has contributed to the growth of operations at the new port. In the first half of 2013 Abu Dhabi’s ports received 18,100 ships carrying more than 4.6 million tonnes of general cargo. 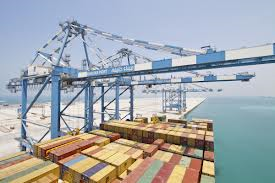 Khalifa Port was inaugurated on 12 December 2012, and its semi-automated container terminal had commenced commercial operations on 1 September 2012. ADCP says by January 2013, the Port had handled 250,000 TEU containers.